All scientific and technological developments are taking place by observing the nature. By observing the birds, aircraft was designed. By observing the fish, ships and submarines were designed. 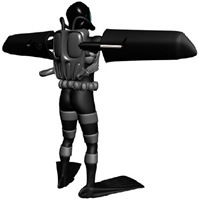 Recently Yves Rossy has flown across the English Channel (35 km) like a bird in less than 10 minutes with his self made jet propelled wing. The researchers from Institute for Human and Machine Cognition of University of West Florida have keenly observed how dolphins,sea turtles and penguins move in water. They have come up with biologically inspired concept designs for underwater swimming exoskeletons. biologically inspired concept designs have the advantages like stealth, handsfree operation and natural interface. 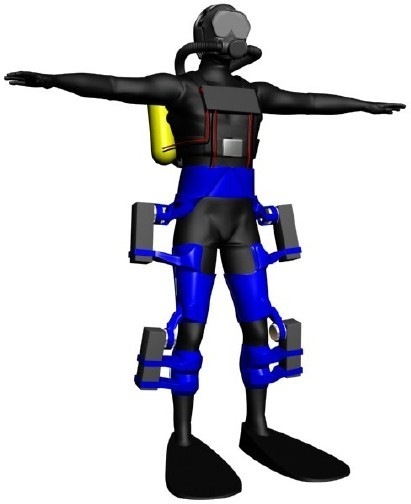 with rapid technological developments taking place in robotics, by using available energy storage devices and actuators, cruising speed of above 1 m/s and maximum speed of above 1.5 m/s is feasible to achieve with an exoskeleton. cruising speed of 1 m/s can be achieved with less than 504 watts of power consumption. Front view – shows the rotary motors shown actuating knee joint and hip joint. Rear view – Yellow cylinders on the back are battery packs for the rotary motors. 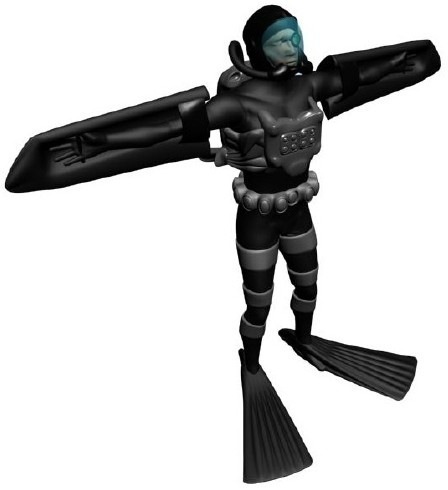 Also rebreather is necessary. 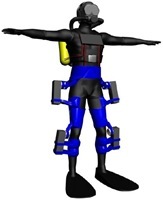 Out of the two exoskeleton designs, the lower extremity exoskeleton is more suitable and easy to adapt. 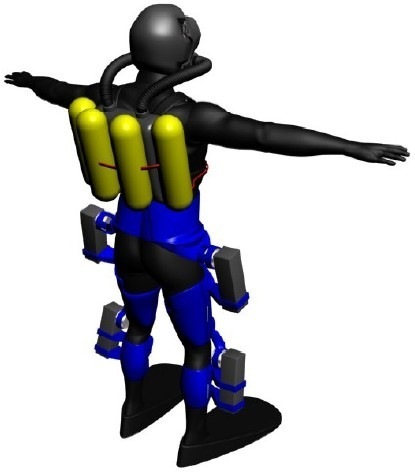 Fore more information on underwater swimming exoskeletons, read Concept Designs for Underwater Swimming Exoskeletons pdf document.